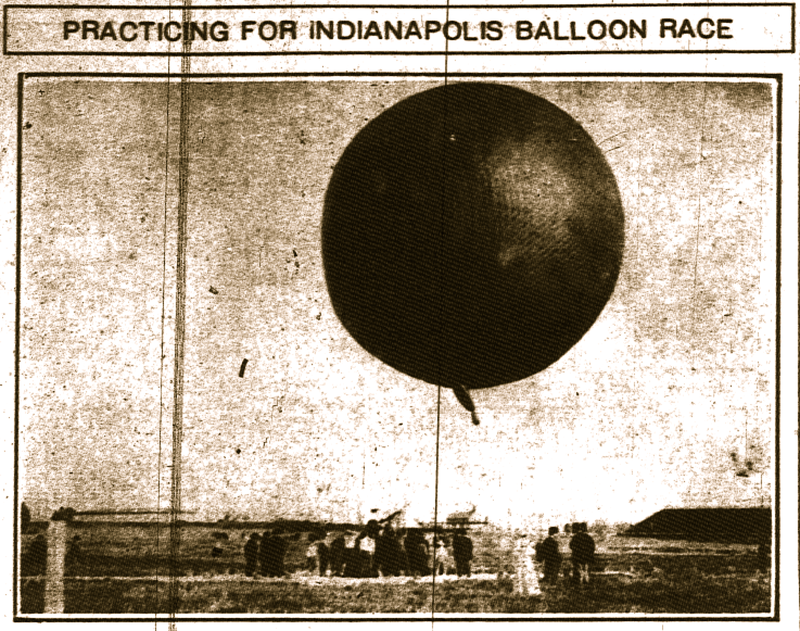 This is an historic photo in that it was the first balloon ascension at the Indianapolis Motor Speedway. Published in the Monday, May 24, 1909 Indianapolis News the photo was taken the previous Saturday. 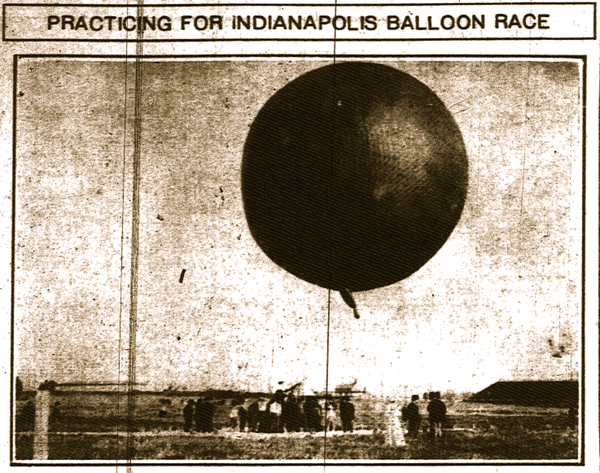 The gas balloon was occupied by Indianapolis Motor Speedway President and Founder Carl Fisher and his ballooning mentor Captain George L. Bumbaugh. Fisher was practicing ascensions and landings under the supervision of Bumbaugh in order to obtain his balloon pilot's license. The balloon is reported to be the Kathleen owned by balloonist and race car driver Charles A. Coey. This event was also historic because it was the first balloon ascension from the Indianapolis Motor Speedway. "Carl Fisher, accompanied by Captain G.L. Bumbaugh, made a balloon trip Saturday afternoon which gives him three trips to his credit in qualifying for the balloon races to be held in this city on June 5. A strong wind delayed the start for many minutes after the big bag had been inflated, but the trip was pronounced successful in every detail. Three landings were made at Bridgeport, five miles south of Bridgeport and at Valley Mills. Just as he was ready to leave the ground on the trip Bumbaugh was handed a telegram which asked that the balloon Kathleen, which he was using, should be sent at once to Sioux Fall, S.D. This meant that the landings should be made without the use of the rip cord, because a day's work is required to repair the damage of this emergency cord. For this reason all the landings were made without using the cord and the balloon was shipped as soon as possible after landing. The above picture was taken at the Indianapolis speedway Saturday." Fisher and Bumbaugh made three "captive" ascensions and a landing photograph comes from one of those. The captive ascension simply means the balloon was attached to a mooring cable and not allowed to drift freely. 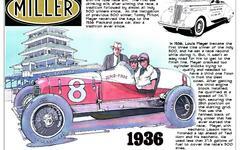 After three captive ascensions Fisher and Bumbaugh were turned loose and traveled well beyond the Speedway grounds. Over 50 men including witnesses to the flights assisted in this historic ascension. There was a lot going on at the Speedway at the moment this photo was taken on May 22, 1909. The track was under construction as management prepared for its first motorized event - a Federation of American Motorcyclists (FAM) motorcycle race as well as its first automobile races. A team of laborers using mules and steam shovels were grading the racing surface and banking turns. At the same time the reason Fisher was in the balloon is because he was preparing to compete in the national balloon racing championship coming up on June 5, 1909.